Julia Banks MP on why Australian families need childcare reforms. "Australian women want to work and raise children at the same time. But they need help." I’ll never forget my emotional reaction to the statement of the “stay at home mum” at my children’s’ primary school’s Christmas picnic. She asked me the loaded question when I’d “dared to share” with her that my planning for childcare arrangements for the following year was proving challenging. This incident occurred some years ago now, however, to this day, Australian parents, particularly women constantly face the judgement call of others regarding their childcare arrangements or whether they should stay at home. These judgmental statements are usually underpinned by the view that a working mum is somehow not as good as a stay at home mum. They often have the effect of what has been dubbed “mother guilt”. Guilt is an emotion that is felt when you do something wrong. It is not wrong in modern day Australia for women to want to work and raise children at the same time. Children need two things in their life. Love and stability. This can be given to children no matter the working lives outside the homes of their parents or single parent as the case may be. Thousands of Australians are living proof of this. However speaking to the thousands of working mums in my electorate of Chisholm – childcare remains a big issue. Whether they’re in the private or public sector – young professionals, teachers, community workers, small business owners, retail shop assistants, nurses, factory workers women all over struggle with “this issue of childcare”. The childcare issue is not only “big” for young families but it’s intrinsically linked to the household budget. And in the main parents just get on with it. Pragmatic budget managers and childcare planners. In dual-working parent households, the birth and immediate childcare of children in the vast majority of cases changes the woman’s life more than the man’s. It not only introduces a whole new ballgame of a different life – but it imposes absence from the workplace, uncertainty about return to work and balancing work and life and childcare. Childcare can often mean a logistical nightmare which necessitates juggling childcare arrangements with grandparents, friends, pre-school, holiday programs to name a few. The reason women go back to work is multi-faceted. It can be to have an income, to supplement an income, to ensure the continuum of hard work of study and career thus far, to keep up to date, to not allow a too long absence from the workplace or a backwards step in a career trajectory, to pay or save for school fees. For me, returning to work when my children were babies was mainly about my always wanting to be financially independent and maintaining my career path. Rewind to the 70s and for my mum it was different. Mum needed to work for the money. Dad’s income in small business wasn&apos;t enough to “make ends meet” and mum’s extra income would help the family finances and "give us more choices". As a young girl - I remember the very disparaging tone of a woman saying to mum that unlike her she “didn&apos;t need to work”. Families are the backbone of our society and although many families are applying common sense, being pragmatic and getting on with it they are only just getting through or just managing. The Turnbull Government’s childcare reforms are pragmatic, make common sense and will help thousands of Australian families. They are specifically designed for parents who want to work, want to work more and provide the highest rate of support to those on the lowest incomes. These reforms are for families who rely on childcare to go to work. This particularly impacts women and will help parents who want to work whatever the reason. They will provide the greatest financial support to those who work the longest hours and the greatest support to those who earn the least. All this whilst remaining committed to providing a strong safety net for families who are unable to work. This will necessarily increase participation of women in the workforce and is a necessity for our economy and for future generations. These childcare reforms make common sense and they&apos;re about being practical and “getting on with it” - just as Australian families do every day. They will provide more flexible and affordable childcare so ultimately more families can have more choices. 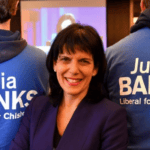 Julia Banks MP is the Federal Member for Chisholm. How important is having access to affordable childcare to your family?